Premiato Pastificio Afeltra has always cultivated its pasta-making tradition with passion, respecting the quality of the ingredients and the unmistakable flavour of Gragnano pasta. The pasta factory manufactures its products in compliance with Reg. CE 852/2004, based on the principles of the HACCP, and this self-control system monitors the whole production process and product distribution chain, in order to guarantee consumer health. Daily checks are carried out on the ingredients and on all production batches by the in-house laboratory and at ACCREDIA-certified independent laboratories. Particular attention is focused on analysing the incoming flours to ensure their chemical-physical and microbiological quality. Routine tests are performed on humidity, protein, dry gluten and ash. 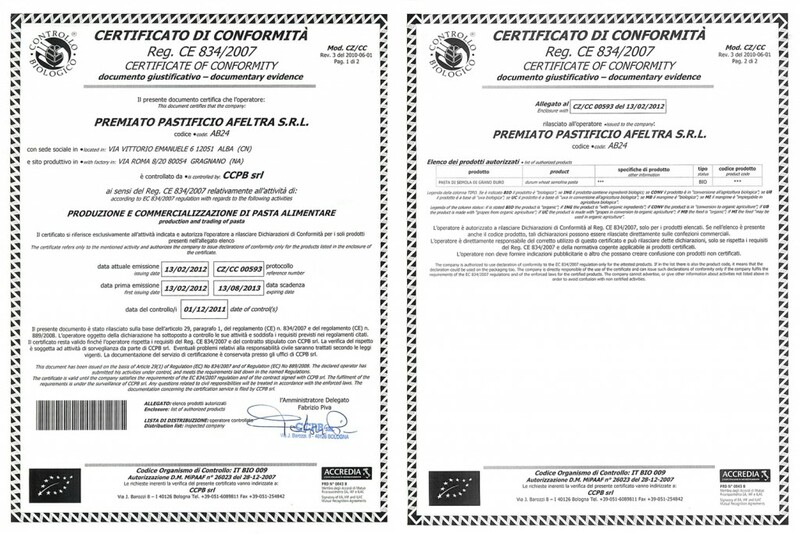 Since 2011, the pasta factory has implemented the control system for the Certification of the Organic Production Method in accordance with Reg. CE 834/07. Organic foods are produced and processed with respect for the environment. In organic farming, no chemical substances (fertilisers, weed killers, fungicides and pesticides in general) and no Genetically Modified Organisms (GMO) are used. separation of the two organic and conventional production cycles (caution and prevention of contamination).